Flatfoot is a very common problem in school age children. Clinically there is lowered medial longitudinal arch, eversion of the heel (outside of the heel turned out), bulging of the talus as it adducts out of the talonavicular joint (large bulge on the inside of the left ankle), abduction of the forefoot (being able to see the little toes on the outside of the foot from the back). Inadequate management can result in persistence of the deformity, callosity and pain. 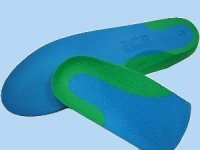 While it is important to provide adequate support of the foot while the foot is growing to its final shape orthosis in general is ineffective for the more severe flatfoot. Fortunately, due to medical advances, we now have a very simple but effective surgical method called arthroresis. It involves the insertion of an absorbable implant at the site of collapse to provide a lasting support during the growing years so that the foot can develop normally. The operation is a quick and safe one lasting only 15 minutes and the implant will be able to support the foot during the growing years of the child.